Stage fright. You know it and hate it. Sweaty palms. Increased heart rate. Too much adrenaline. I once did a performance where I was so nervous I don’t remember the gig! There are plenty of resources to help you overcome stage fright and you should definitely seek them out. 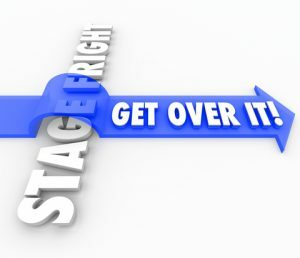 Stage fright is not something you have to live with. You can overcome it! I did and so can you. Here are some strategies that have helped me and my students. Students often confuse nervousness and excitement. I ask them, “Are you nervous or excited?” Both are normal and it’s completely ok to feel them. But remember just because you have elevated feelings it doesn’t automatically mean you’re nervous. You can perform and enjoy your excitement. I have often said that most of us could probably walk on stage right now and play Twinkle, Twinkle Little Star quite well. Why? We know it. It’s easy. We have played those simple notes and rhythms in a multitude of situations. OK so ol’ Ben said eyes not ears but the concept really applies here. Evelyn Glennie uses her entire body to hear since she’s deaf. Our body has many ways to gather data and hearing is just one of them. The more senses you can employ, the less each one matters. If you only rely on your hearing and that one system fails you – even for a few moments or notes – you’re sunk! But let’s say you’re employing hearing, tactile / feeling, and visual. Then hearing is only a third and if for a few seconds your hearing fails then you still have 67% of your systems being successful. For example, when I’m tuning my bass I can feel in my left hand the out of tune harmonics clashing and creating the beats of the sound waves interacting. I have also used this technique to teach sound waves to children. I’ll play an open G and a out of tune closed G and have students place their hand on the top of the bass to feel the beats. – Smile when you play – really, try it! – Practice without the music stand in front of you! The stand becomes a sort of comforting shield when you always practice with it. – Practice in different environments. Or even just different rooms. – When performing don’t get hung up on mistakes (also practice performing like this). You’re telling a story and a missed word here or there won’t affect the story. Think of reading a book. Even if you missed a page you’d still get the story. Practicing all these different ways can also be revitalizing and invigorating. It can break us out of ruts. After decades of playing it can refresh our playing and bring back the fun that we experienced years ago. And it will make your performances much more comfortable and enjoyable.